I have been loving Juli Bauer's Paleo Cookbook. 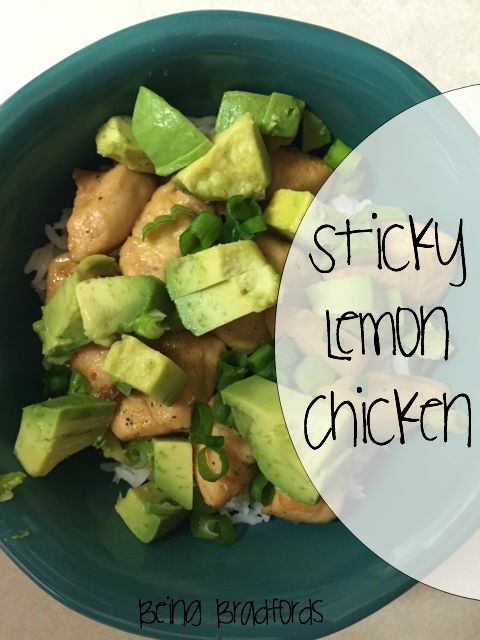 There are so many good recipes and one I've made a few times now is the Honey Lemon Sticky Chicken. I'm not a huge chicken fan because I feel like chicken goes from undercooked to overcooked in a split second. I always tend to overcook it but somehow I've managed to accurately follow this recipe. YAY! I think the sauce really helps to keep the chicken tender and delicious. Plus it has a little sweetness but isn't overboard, which is always good in my book. The only thing that I can't figure out is why my sauce won't reduce. It's supposed to reduce by 1/3 and mine definitely doesn't come close. Oh well, it's still yummy though! 1. Melt the butter in a large sauce pan over medium heat. Add the onion and garlic and cook until the onion is translucent, about 5 minutes. 2. Season the chicken with salt and garlic powder, then add to the pan. Brown on all sides until cooked through, about 12 minutes. Remove from pan and set asides on a plate. 3. In a medium bowl, whisk together all the sauce ingredients. 4. Reduce the heat to medium-low and place the sauce pan back over the heat. Pour in the sauce mixture and bring to a low boil. Let the sauce reduce by about one-third, about 10 to 15 minutes, until the sauce coats the back of a spoon. 5. Once sauce has thicken, return the chicken to the pan and cook for 2 minutes to warm the chicken through. 6. Serve over cauliflower rice, garnished with sesame seeds and chopped scallions and seasoned with pepper. *I used soy sauce instead of coconut amino and white vinegar instead of coconut vinegar.